"Lyonetiidae" in the 1983 checklist included the yponomeutoid family Lyonetiidae (as defined on basis of the genus Lyonetia), which is covered on this page, and also the tineoid/gracillarioid-allied groups Bedelliidae and Bucculatricidae. Lyonetiidae is represented in North America by fewer than 20 described species. Larvae of most species are leaf miners on woody plants. 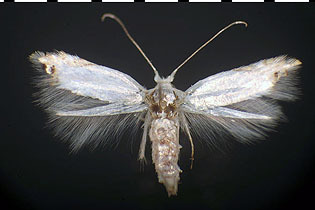 Adults usually are opalescent white moths, often with a metallic patch at or near the tornus on the forewing. The larva of Paraleucoptera albella (Fig. 1) makes a brown, somewhat puffy leaf mine on cottonwood, Populus deltoides (Salicaceae) in early July (central Illinois). After the larva finishes feeding, it leaves the mine and seeks out a depressed notch (usually at the midvein of a leaf) where it pupates in a white silken cocoon that is overlaid with two transverse bands of silk. Figure 1. Paraleucoptera albella. Adult, reared from leaf mine on cottonwood, Populus deltoides (Salicaceae).